DHAKA—In April 2013, the Rana Plaza building in Bangladesh’s capital city collapsed, killing 1,100 garment workers. More than 2,500 were injured. As survivors struggle in the aftermath of the disaster, the victims’ compensation fund finally reached its $30 million target last week. Rehana Akter was working on the seventh floor of the Rana Plaza when she felt a strange sensation, “like being in an elevator.” A huge roaring sound erupted. Darkness fell over the garment factory where the 24-year-old worked. People started to run and scream. Rehana fell, her leg twisted beneath a concrete column. Nearly 12 hours later she was rescued from the rubble. Rehana’s leg was crushed and six days later it was amputated above the knee. The collapse of the eight-story Rana Plaza was the world’s worst garment factory disaster. A pledge from an anonymous donor announced last week completed the $30 million Rana Plaza Donor Trust. The voluntary fund includes donations from international clothing companies, the Bangladeshi government and others. It was established by the International Labor Organization (ILO) last year to compensate survivors and families of the deceased. The compensation committee gave an update in April on the second anniversary of the collapse. At that point, more than $27 million had been raised and 70 percent of compensation paid to some 2,800 claimants. Now, with last week’s news that the trust is complete, all payments can be made. They range in size from a minimum of about $625 (50,000 taka) and nine months of salary for those without injuries. Some people received more than $31,000 (2.5 million taka) depending on their circumstances, according to Mojtaba Kazazi, executive commissioner of the Rana Plaza Claims Administration. But just half the clothing companies connected to Rana Plaza contributed to the fund, including Mango, Primark, Walmart, C&A and Inditex, owner of Zara, said the advocacy group Clean Clothes Campaign. In April, Benetton announced a contribution of $1.1 million to the fund, after months of campaigning, urging them to pay $5 million. More than two years later, many survivors are still struggling. Money alone is often not enough. For example, some female garment workers say their husbands left them for other women after taking their compensation payments. Others still experience mental trauma or physical pain that makes it difficult to work. Rehana received treatment from the Center for the Rehabilitation of the Paralyzed, a hospital in Dhaka near Rana Plaza. Last year, she began walking with a prosthetic leg made at the center. It also gave her a cow and training as a way to make money. Her stump is sore with the prosthesis and she uses a cane to walk. She has trouble pumping water and carrying things. Some of the neediest survivors received additional help from organizations such as the Center for Rehabilitation of the Paralyzed, non-profit ActionAid, German aid agency GiZ, the ILO and local partner non-profits. They supply training for new jobs or start-up funding to open a small business. Liton Mia, 35, was a supervisor on the fourth floor of the Rana Plaza. After the building’s collapse, he was trapped between concrete slabs for fourteen hours until he was rescued by a university student. Mia’s leg was fractured and he could not work for seven months. He said he was under “serious stress” trying to figure out how to support his family. Mia received about $1,200 (95,000 taka) in compensation and attended a skills training workshop funded by GiZ. With in-kind start-up capital, last July he opened a business that rents out lights and sound speakers for parties. Mia sits in his small store surrounded by big coils of fairy lights. He hires two workers to hang strings of lights that light up houses during weddings. Mia makes from $260 to $650 (20,000 to 50,000 taka) in revenue each month, compared to his salary of $140 (11,000 taka) at the garment factory. He said he used to recall the traumatic memory of the collapse. But after being involved in this business, he is always busy and doesn’t have time to think about what happened. In a quiet lane a few miles from Rana Plaza, Shahjahan Selim tends his small grocery shop. He sits on a stool as customers ask for laundry powder, soda and cigarettes. The 37-year-old cannot use his hand very well, so sometimes customers count their change from a plastic box on the counter. Selim was a supervisor on the fifth floor of the Rana Plaza. He was uninjured in the collapse but went back into the wreckage when he heard cries for help. Over four days, Selim rescued 37 people and recovered 28 bodies. On the fourth day, he freed a man by using a saw to cut off an arm pinned beneath a concrete beam. But then Selim slipped and fell four stories, seriously injuring his back. He was hospitalized then treated at the Center for the Rehabilitation of the Paralyzed for nearly a year. Today Selim walks laboriously with a cane. 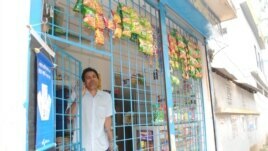 With training and money from Action Aid and ILO, Selim opened the tidy shop where he works seven days a week. As many as 200 customers come each day. The store helped him to “go ahead”, he said. Even though Selim is permanently disabled, he does not regret going back into the wreckage of Rana Plaza. But he said the disaster should have never happened. Sweeping safety initiatives are going on now in Bangladesh. Meanwhile, survivors of Rana Plaza struggle and carry on with their lives.